The recent violence in Charlottesville, VA has left us reeling. How do we deal with this? How do we stay engaged and stay grounded too? 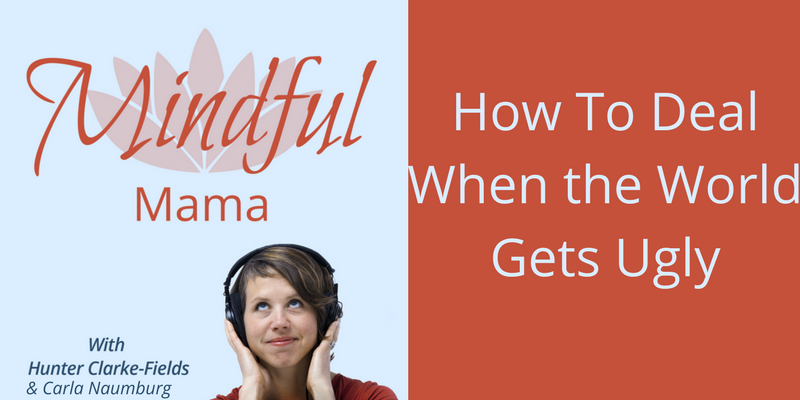 In this special episode of the Mindful Mama podcast, Carla Naumburg and I discuss these issues and give you seven ways to move through this time mindfully. Get Grounded First. Don’t turn on the news and check your email as you get out of bed. Take time each day to consciously cultivate peace in yourself and set your intentions for the day. Notice Your Thoughts. Be aware of when your thoughts are coming from a place of fear and scarcity. Once you are aware, then you can choose not to act from that place. Practice Openness & Non-judgement. Even if it’s simply with yourself and your children. If you have the bandwidth, be curious about how those on the other side came to their views. Take Refuge. You do NOT have to have the news on all the time. Consciously take time for peace and quiet. Try a screen-free day. Take Care of Fear & Anger. The roots of so many of the problems are in people’s inability to take care of their difficult feelings. Let us learn from this and practice to not suppress or drown in our big feelings, but instead move through them mindfully. Practice Clear Seeing. Be grounded in what is really real in your life right now. Your thoughts are often untrue, but what do you see? Hear? Taste? Touch? Get in touch with what is real. Take Thoughtful Action. This may range from radical self-care so that you can keep it together during this time to running for office. Let your actions be based in love rather than fear. There are times when the world feels fundamentally unsafe. When that happens, we can empower ourselves to create more safety for ourselves and others. When you create peace in yourself, you help create peace for your family and the world. Do not discount this power. Click here to learn about how to talk to your kids about national news. Thank you so much for listening today. If you got something out of this podcast, please share it with your friends and family. What are you doing to take care of yourself at this time? Start the conversation in the comments below! P.S. You can download the audio training, Mindfulness For Moms (The Superpower You Need) for free! It’s at mindfulmomguide.com.